How do the kid bands work at Join the Band? At our Sherman Oaks studio your child will experience what it’s like to be in a real band where everyone plays a part. We can place your child with the right private music teacher and band class for their needs. 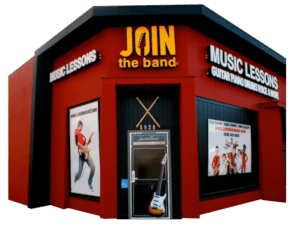 Our band and lessons program features guitar, drums, piano, keyboards, bass guitar, voice and more at our Sherman Oaks studio. Bands rehearse in our professional Join the Band studio under the guidance of a professional musician and experienced music teacher. The bands perfrom in front of packed houses at our famous Join The Band® Concerts. * Most bands perform three songs. Depending on age and level, some bands will perform two songs. What are the benefits of playing in a band for kids? More than music… Besides playing with like minded students, students at Join the Band learn the value of working with a team to accomplish the goal of performing in a Los Angles music venue. Being a part of something bigger than themselves brings out the best in our students. Students in our bands become more focused, they support their fellow band members, and become a team player. What is a good time start playing in a band? Students need to establishment basic rhythm and techniques skills on their instrument before playing in a band. Kids as young as seven have played in our bands. However we do evaluate everyone to make sure they are ready for the band experience. After we determine they are ready for a band students are matched up with kids based their on level and age. Want to know what our JTB families are saying about our kid bands? “This is by far the best thing I’ve ever done for my kids. I wish they had something like this when I was a kid. As a musician myself I know the value of music and the effect it has on young minds. To this day there are very few things that bring me more joy than playing music in a group. “Join the Band is Hands down the best music performance program available for aspiring musicians. Having two sons that are interested in music performance, we have tried them all! No program can compete with this one… which is why after going through so many, we have stuck with Join the Band for four years and counting. It all starts at the top and Program Director John Mizenko has created something very unique here. The program manages to be both fun and serious. Rehearsal and lessons are efficient and effective, fun but focussed. The show days are amazing… It is a great day out and seeing just how far they bring these kids in a short time is nothing less than awe inspiring. John makes the program feel like family and you can see his pride every time an act takes the stage! Whether you’ve been playing for a while or just starting out, we’ll place you in a band that’s just right for you. What will I do in my band? 1. Learn to play well with others. 2. Play music with like minded kids. 3. Learn to reading charts. 4. Learn how to use stage amplifiers. 5. Practice and rehearsal techniques. 6. Performing in front of a live audience! Call Today & Rock Tomorrow! Choose a band program that limits each band size. Join a rock band program that schedules age appropriate bands. Choose a rock band program with experienced music teachers. Find a band program where the kids play in a fun & professional studio environment.